Ingredients: 1 slice Ezekiel bread, 1 egg white, 2 tbsp almond milk, 3 tsp cinnamon, 1 bananaâ€¦ And 3 kabob sticks. Directions: Dip bread in egg white and almond milk, sprinkle both side with cinnamon, and grill on both sides. Slice banana, cut bread into 9 small squares. 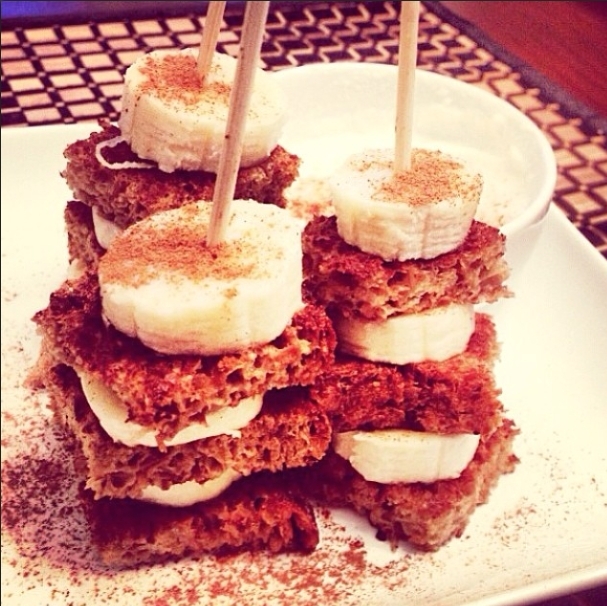 Stack 3 banana slice and 3 bread bites on kabobs and sprinkle with cinnamon.